Smart Cable technology is available for blood pressure, cardiac output, EtCO2, FiO2, temperature, thermistor respiration monitoring, and Nihon Kohden has just released a Smart Cable for BIS. As new parameters are developed, Nihon Kohden will continue to develop additional Smart Cable modules, guaranteeing your monitoring investment against obsolescence. 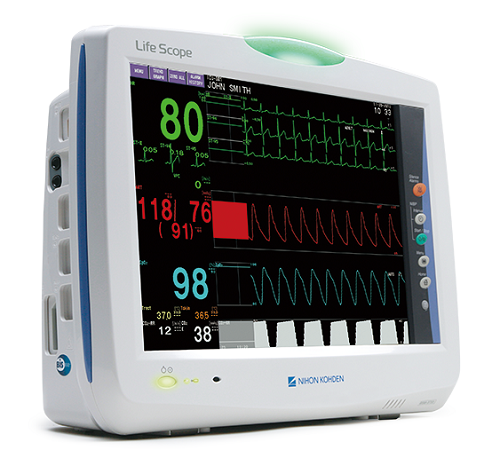 The input section of the monitor can be detached and plugged into a different Life Scope TR bedside monitor. This reduces time plugging and unplugging cables. There are two types of standard input units and extension units (Smart Units). With an optional Smart Unit, the monitor can have up to 7 MULTI connectors for a Smart Cable. Input units with a Masimo or Nellcor SpO2 connector are available. When you plug a different transducer, such as IBP, temperature, CO, CO2, FiO2 or BIS into a MULTI connector, it automatically detects the type of parameter and starts measuring. No extra setup or different modules when changing the parameter. This feature provides cost savings as well as more efficient monitoring. With an optional Smart Unit, the monitor can have up to 7 MULTI connectors. Two battery slots allow two batteries for double the operation time. Each battery provides 60 minutes (BSM-6301/6501) or 45 minutes (BSM-6701) operating time. 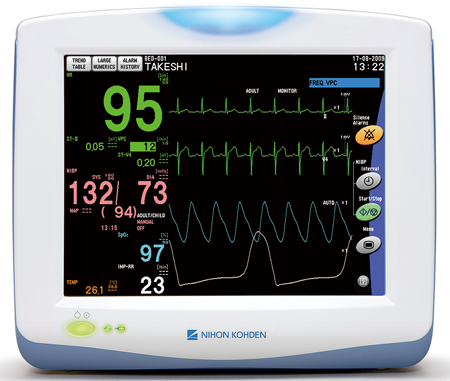 The blood pressure measuring technology in this monitor uses Nihon Kohden’s patented PWTT technology (US patent no. 5564427, other patents pending). Smart Cable technology is available for blood pressure, cardiac output, EtCO2 monitoring, and Nihon Kohden has just released a Smart Cable for BIS. As new parameters are developed, Nihon Kohden will continue to develop additional Smart Cable modules, guaranteeing your monitoring investment against obsolescence. The basic parameters (3, 6 and 10 lead ECG, respiration, SpO2, NIBP, and dual temperature) use dedicated cables and connectors. When you plug a different transducer, such as IBP, CO, CO2 or BIS into a MULTI connector, it automatically detects the type of parameter and starts measuring. No extra setup or different modules when changing the parameter. This feature provides cost savings as well as more efficient monitoring. BSM-3700 has 3 MULTI connectors and BSM-3500 has 2 MULTI connectors. The concept of PVM-2701 is «supreme ease of use.» The PVM-2701 provides a solution for hospitals that want to improve quality and streamline operation. 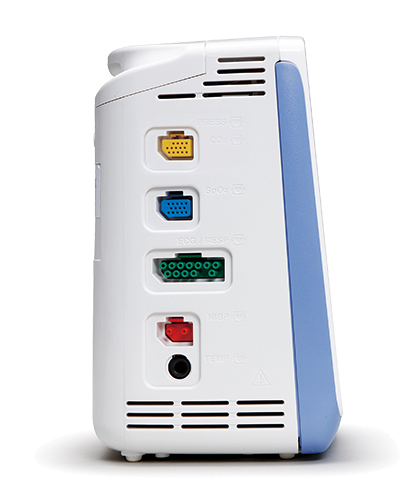 PVM-2701 combines high accuracy and simple operation to satisfy every caregiver from expert to trainee. An onscreen operation guide makes PVM extremely easy to use. For example, if a technical alarm occurs, illustrations show you how to solve the problem. The guide also shows correct measurement of ECG, SpO2 and NIBP. The concept of PVM-2703 is «supreme ease of use.» The PVM-2703 provides a solution for hospitals that want to improve quality and streamline operation. 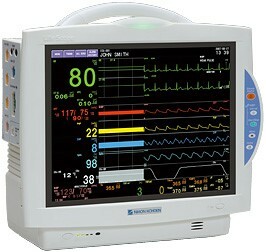 PVM-2703 combines high accuracy and simple operation to satisfy every caregiver from expert to trainee. 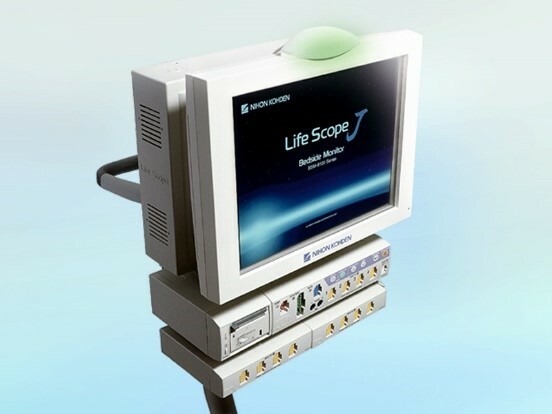 An onscreen operation guide makes PVM extremely easy to use. For example, if a technical alarm occurs, illustrations show you how to solve the problem. The guide also shows correct measurement of ECG, SpO2, NIBP, IBP and CO2.